Ahhh, its Valentine’s Day. The hearts, flowers, candy, teddy bears…your kitchen?! Yes your kitchen! Today is a day filled with love and romance, so it got us in the mood to inspire you with some romantic kitchen update ideas. After all, what better place is there to set a love-inspired ambience than the “heart of the home”? Romance is a mood, a feeling. Think soft, clean and curvy. Don’t feel like you have to do all of this today – it’s a little late in the day to get started, but romance doesn’t have to come only once a year. Use Valentine’s Day as an inspiration to create a romantic setting that will last for years. Here are some ideas to get you going. When it comes to kitchen lighting, we have one word: Soft. Indirect lighting has a nice soft effect. Add lighting under the cabinets for a warm glow. Change out your kitchen cabinet doors with soft glass inserts and install cabinet lighting on the inside. Light reflecting in a cabinet full of glass or crystal pieces gives a beautiful touch of romance. Adding a dimmer switch to your pre-existing overhead lights is an easy and inexpensive change as well. Dimmers will help give that candle lit dinner ambience, and who doesn’t love that? If you really want to go the extra mile, add a beautiful chandelier above the dining area to really set the tone, or a decorative glass backsplash to help add some soft reflection. If you have the resources and space, you may even be able to install a fireplace to help with those after-dinner smores. 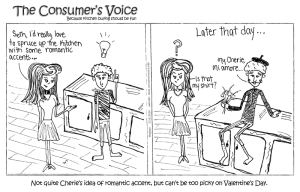 Romantic may not be the word that comes to mind when you are thinking about appliances, but let’s give it a try. You want the kitchen to be warm and inviting- and if done correctly, it will ultimately become a comfortable gathering place for friends and family. Think about items that would make entertaining a little bit easier. Double oven, convection oven, warming drawer, beverage centers complete with a small refrigerator to help hold appetizers and drinks, bottle openers and wine chillers. Appliances, such as refrigerators, are now made with a cleaner, rounded edge which softens up the look. You can even find kitchen sinks and faucets with a soft curve to them. This is where you can really play up the romantic feel (and you still have time to do some of these suggestions today). Think candles, china, crystal, Frank Sinatra music in the background, picture frames, a beautiful fresh coat of paint, lace-place settings, flowers and curtains. Nothing says romance in a kitchen like material. Think soft, flowing fabric…blowing in the breeze when the window is slightly open. Add a few cozy comfortable chairs and you are set. If you decide to incorporate a romantic theme in your kitchen, ask your kitchen designer or salesperson how to create an oasis that gives a soft, dreamy, harmonious feel. Chances are, you’re not the first person who has asked, so they should already have some great tips. If you’re planning to update your kitchen or have already received advice from an expert, feel free to leave more tips in the comment section. We send our love – now go spice up your kitchen!